All units have Cable TV, free wi-fi, phones, air conditioning, gas fireplaces and full kitchens with dishwashers (except 6149) All pricing is PER NIGHT (WEEKLY RATES AVAILABLE). During certain times, a minimum length stay may be required. All dates are approximate.Maximum Occupancy is based on total number of adults, children and infants. We’re sorry but Kavanaugh’s Resort does not allow pets. 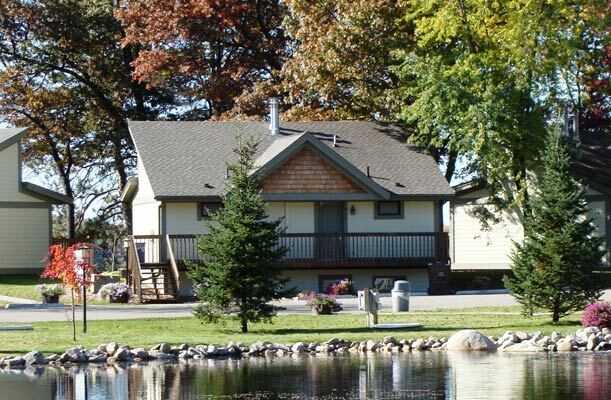 Click here for winter lodging & rates. One bedroom individual cottages for 2-5 people. 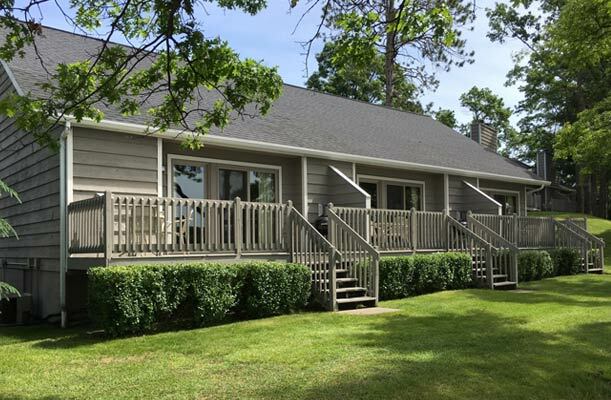 The Oaks have a king size bed, full bath, gas fireplace and twin size hideabed in the master bedroom, a separate dining area, kitchen and a living room with gas fireplace, hideabed, full bath and lakeside deck. Rates Rate Based On up to Maximum Occupancy of five (5) persons. One plus bedroom units for 2-4 persons. The Maples feature one large bedroom with a queen size bed and a full bath, a full size kitchen, dining area and a living room with gas fireplace. The living room has a queen size wallbed that pulls down to create a separate sleeping area with its own private bath. 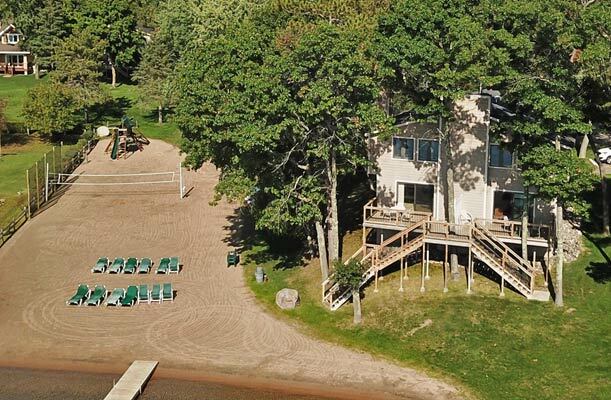 There is a lakeside deck off the living room. Rates Rate Based On up to Maximum Occupancy of four (4) persons. The Westwoods feature two separate bedrooms on the upper level each with its own bath, one with a king size bed and one with a set of twins, the main level has a large kitchen, dining room area, washer-dryer, 1/2 bath and a living room with hideabed, a gas fireplace and lakeside deck. There are three Westwoods in one building making it an ideal location for several families wishing to stay in the same area. Rates Rate Based On up to Maximum Occupancy of six (6) persons. Ideally suited for families of 4-6 people. The Views feature an upper private bedroom with two double beds and a full bath. Downstairs the living room becomes a second sleeping area with a queen size bed that can be pulled down from the wall. 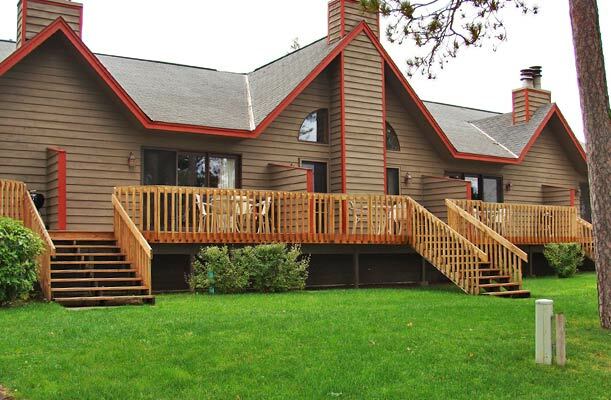 There is a full bath off the living room, a gas fireplace, and a lakeside deck. Also, featured is a full size kitchen with eating counter. Rates Rate Based On up to Maximum Occupancy of six (6) persons. 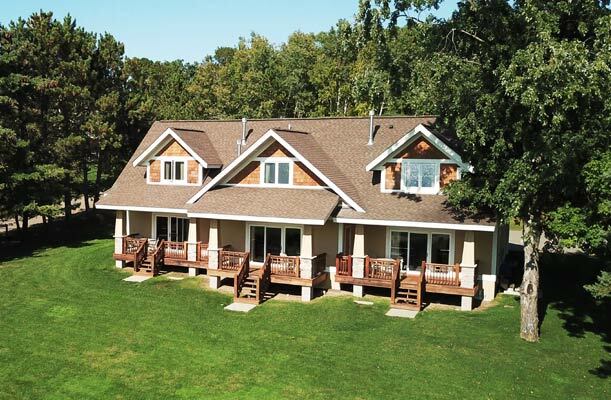 The Cedarwoods feature three separate bedrooms and two baths on the upper level. One bedroom has a queen size bed, one has a double and one has a set of twins. The main floor has a full bath, a living room with a hideabed, gas fireplace, lakeside deck and a large kitchen-dining area. Rates Rate Based On up to Maximum Occupancy of eight (8) persons. 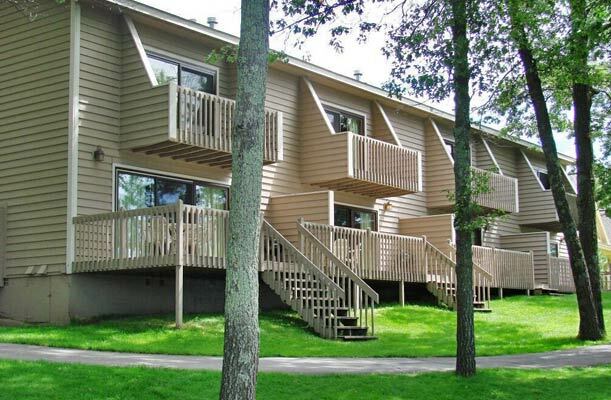 The Woods feature three separate bedrooms and a full bath on the upper level. One bedroom has a king size bed, one has a queen and one has a set of twins. The main floor has a full bath, a living room with a hideabed, gas fireplace, lakeside deck and a large kitchen-dining area. Rates Rate Based On up to Maximum Occupancy of eight (8) persons. The Pool Suites are located adjacent to the pool complex. All feature one large bedroom with two queen size beds, a full bath, large living room with gas fireplace and a full kitchen with adjacent dining area. All have patios off the living room. 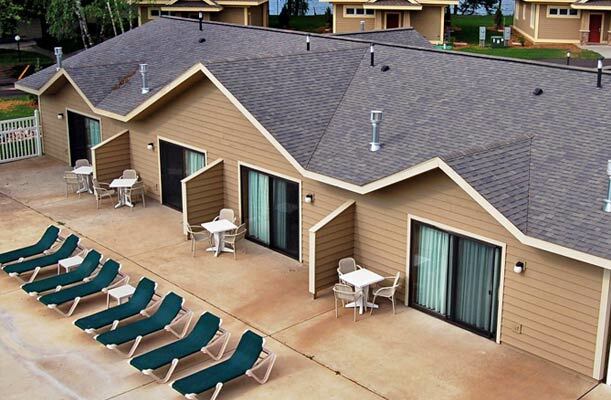 Four units are poolside and four units are pond side, adjacent to the outdoor pool. Four of the rooms are wheelchair accessible. Rates Rate Based On up to Maximum Occupancy of four (4) persons. The cottages are separate two story units featuring two bedrooms with two baths upstairs and a master bedroom and bath on the main level. The main level also has a living room, dining room, kitchen with eating bar, a gas fireplace, washer-dryer and a covered lakeside porch. Rates Rate Based On up to Maximum Occupancy of eight (8) persons. 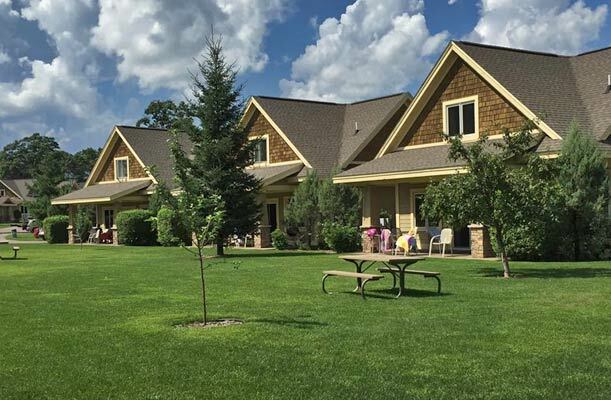 All units have Cable TV, wi-fi, phones, air conditioning, gas fireplace, Weber charcoal grill and full kitchens with dishwashers (except 6149). During certain times, a minimum length stay may be required. Weekend rates are based on Friday and Saturday night stays. SALES TAX NOT INCLUDED IN PRICING. All published rates, dates and policies are subject to change without notice.